As the world’s third most important crop, potatoes, which are grown in more than 100 countries around the world, can produce more food per unit of water than any other major crop, according to the International Potato Center. These impressive little tubers are indigenous to the Andes Mountains in South America, but they’ve spread around the world in just a few centuries. Researchers have identified more than 4,000 varieties of potato worldwide. Despite being such a diverse crop, most potatoes fall into one of two categories: starchy or waxy. Starchy potatoes, like the standard Idaho or russet, work best for dishes like mashed or baked potatoes; waxy ones, such as red potatoes and various fingerling varieties, are firmer and denser, and hold their shape when cooked — whether fried, roasted, or boiled. Sweet potatoes are from a different botanical family altogether and are only distantly related to the common potato, but we've included a few recipes for them here, since they may be used in ways similar to starchy potatoes and are increasingly popular for their high nutritional value. There are, of course, countless way to cook potatoes. Lucky for you, The Daily Meal has curated a list of 50 of our favorite potato recipes. We have mashed, baked, boiled, and fried potatoes and more, paired with all sort of flavors combinations guaranteed to satisfy your hunger. Here is a hearty and delicious stew that comes together easily using a slow-cooker and freezes beautifully. For the African Sweet Potato Stew recipe, click here. Jazz up your roasted potatoes with pinot noir-infused caramelized onions. For the Animal-Style Crispy Potatoes recipe, click here. These no-fuss sweet and smoky potatoes are guaranteed to please any appetite. For the Barbecue Potatoes recipe, click here here. Crunchy bacon combines with chewy beer-roasted Brussels sprouts and potatoes to create a hearty side. For the Beer Roasted Potatoes With Brussels Sprouts and Bacon recipe, click here. Sliced paper-thin, crisp radishes are tossed with tender Boston lettuce and tangy, lemony vinaigrette. Then the salad is dotted with deliciously smoky, grilled fingerling potatoes — adding up to a mouthwatering salad that's perfect warm-weather fare. 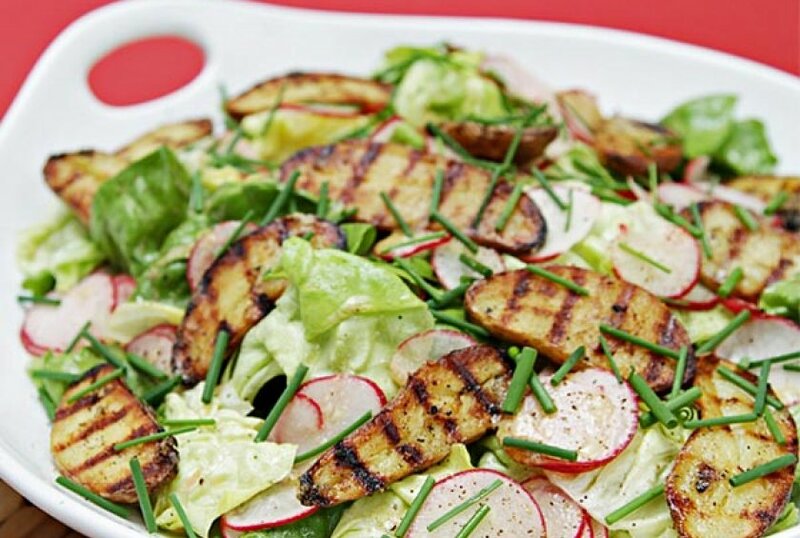 For the Boston Lettuce and Radish Salad With Grilled Fingerling Potatoes recipe, click here. These beautiful browned potatoes combine with sweet butternut squash, making a colorful side for any dinner. For the Browned Butter Smashed Potatoes With Butternut Squash recipe, click here. True, this dish was traditionally designed for a Thanksgiving table, but the sweetness of the brown sugar and the chocolate will make you want this dish more than once a year. For the Brown Sugar-Glazed Sweet Potatoes With Marshmallows and Chocolate Shavings recipe, click here. The richness of the butternut squash complements the potatoes perfectly, plus the orange and white swirls are beautiful. This dish is almost too good to believe considering the simplicity of preparation. 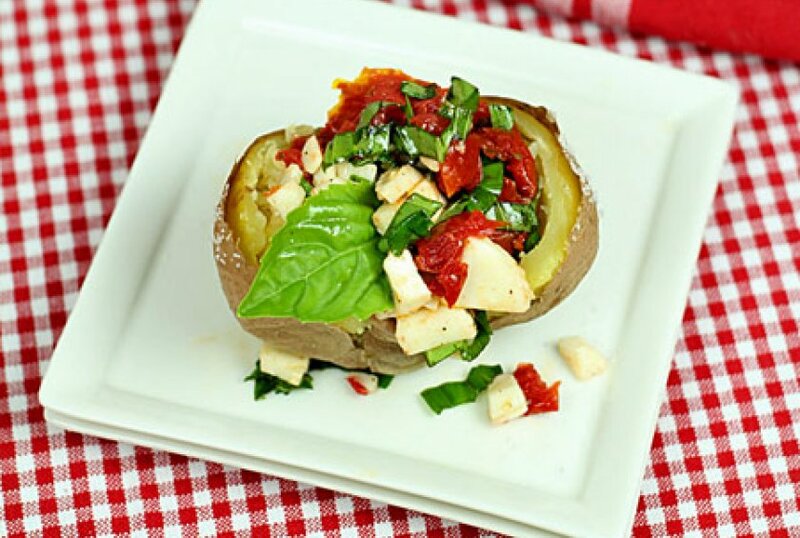 Basil, mozzarella, and sun–dried tomatoes are stuffed into a baked potato and the spud is twice-baked. For the Caprese Stuffed Baked Potatoes recipe, click here. Improve your basic mashed potatoes by adding softly caramelized onions and plenty of olive oil. When you drench the humble sweet potato in island flavors — rum and lime, brown sugar, ginger, and peppers — it’s like giving an old familiar song a completely new beat. For Cat Cora’s recipe for Sweet Potatoes and Olive Casserole, click here. A perfect one-dish meal, layering ham in with the potatoes for a simple but hearty dinner. For the Chew Nibble Nosh ‘Scalloped Potatoes’ recipe, here. Chorizo adds a rich, spicy kick to cheesy mashed potatoes, ready to eat in just about 25 minutes. For the Chorizo Smashed Potatoes recipe, click here. Everyone needs a go-to mashed potato recipe. This could be yours. These finger-sized potatoes benefit from covered baking in the oven, making them soft and flavorful, and then achieve the final level of crispness with a quick stint under the broiler. Grating the nutty pecorino before broiling gives the potatoes a touch of creaminess, and adding more after is just pure brilliance. 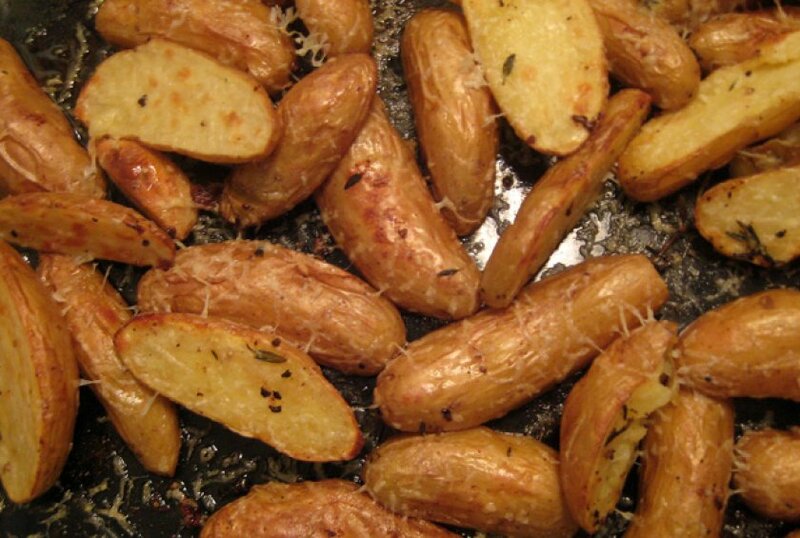 For the Crispy Fingerling Potatoes With Pecorino recipe, click here. Get all of the flavors of loaded baked potatoes into every crevice of thinly sliced fingerling potatoes for an easy appetizer that everyone will love. For the Crispy Loaded Potatoes recipe, click here. This classic potato dish, similar to deep-fried potato croquettes, is the perfect bite or appetizer. For the Dauphine Potatoes recipe, click here. Potatoes meet mac and cheese in this creative twist on two dinner classics. For the Deluxe Scalloped Potatoes recipe, click here. Forget the egg whites: Chef Paul Jervis gives deviled eggs a makeover, serving the rich, creamy yolk filling in a potato. For the Deviled Potatoes recipe, click here. These fancy and elegant potatoes are sure to impress at any dinner party. For the Duchess Potatoes recipe, click here. This delightful hors d’ouevre is a classed-up take on the typical potato skins recipe. For the Fancy Potato Skins With Chorizo recipe, click here. Sweet, savory, smoky, and meaty — these grilled sweet potatoes belong on your dinner table. For the Grilled Sweet Potatoes With Soy Sauce, Maple, and Bacon recipe, click here. This recipe combines the best of both worlds to bring together two of America's favorite comfort food dishes — grilled cheese and scalloped potatoes — for the ultimate gooey, cheesy side dish. For the Grilled Triple-Cheese Scalloped Potatoes recipe, click here. A hamburger-loaded potato satisfies any burger craving and keeps things gluten-free. 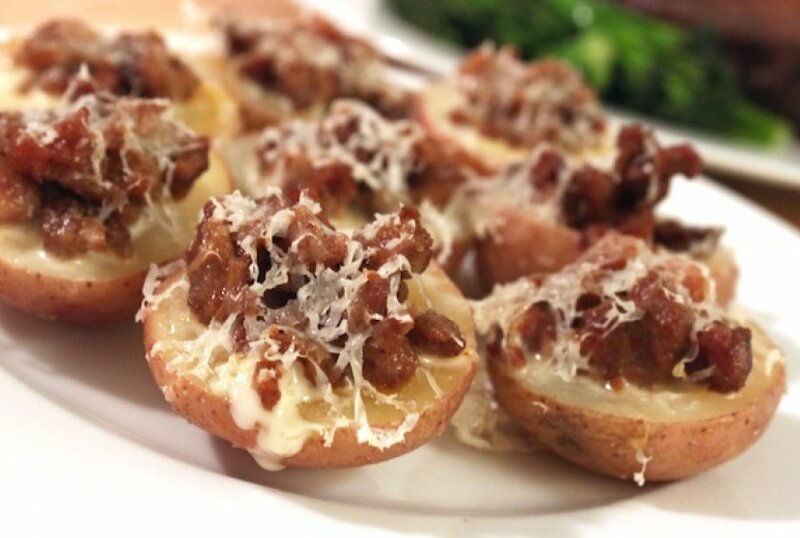 For the Hamburger-Stuffed Potatoes recipe, click here. This glorified baked potato has a fun and festive presentation that is sure to impress your guests. You’ll have more delicious crunchy outsides than you could have ever hoped for. For the Hasselback Potatoes recipe, click here. 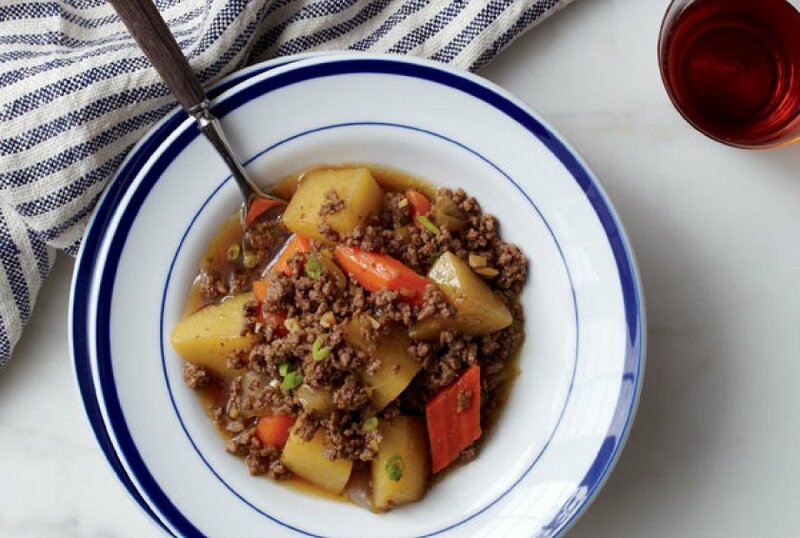 This recipe is based on a popular Japanese stewed dish called nikujaga (niku means "meat”; jaga means "potato"). It’s home cooking at its best — the kind of food you want to eat when you’re tired, in a funk, or under the weather. For the recipe for Japanese-Style ‘Meat and Potatoes’, click here. The lemony citrus enhances the flavors of both the nutritious broccoli rabe and the crispy roasted potatoes. For the Lemony Roasted Potatoes and Broccoli Rabe recipe, click here. 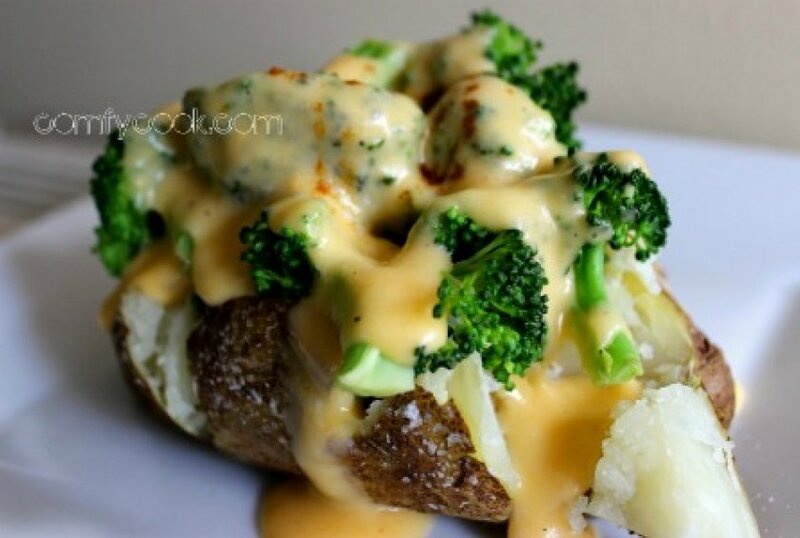 Fluffy baked potatoes loaded with steamed broccoli and smothered in a tasty cheese sauce will make anybody glad to eat his or her green vegetables. For the Loaded Baked Potato With Broccoli and Cheese recipe, click here. 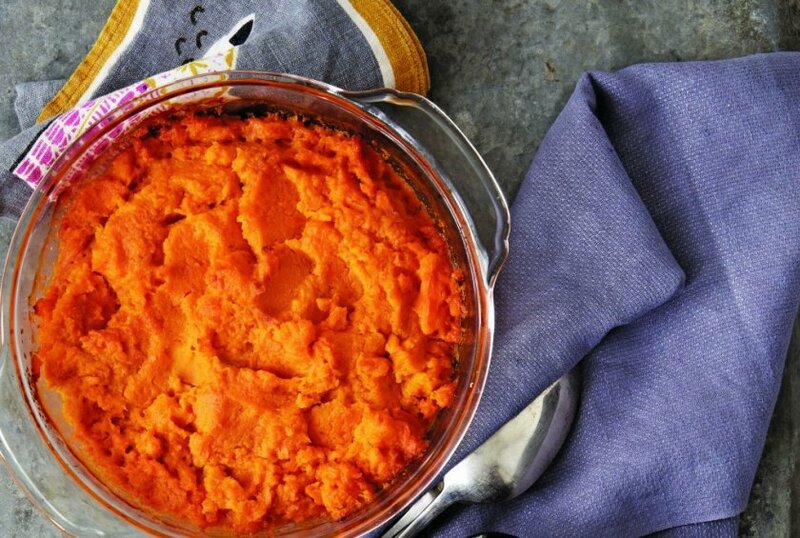 Roasted sweet potatoes are simple and delicious, but to make your sweet potatoes even better, roast them with the skin on, mash them, then bake them again. Your mashed sweet potatoes will be smooth and have a citrusy kick from the orange juice and sherry vinegar. You can use leftover mashed potatoes for this fancy potato dish from acclaimed chef Masaharu Morimoto. The additions of dashi, sake, soy sauce, caviar, and wasabi will create a potato soup unlike any you’ve had before. For the Mashed Potato Soup With Wasabi and Chives, click here. This version of mashed potatoes tastes good because it's dense with the mildly sweet flavor of parsnips and just enough butter to please, but with fewer calories than you usually find in mashed potatoes. Try this new version of mashed potatoes using scallion garlic oil for a lightly Asian twist on a classic. For the Mashed Potatoes With Scallion Garlic Oil recipe, click here. Does it get any better than potatoes and bacon? Yes, actually it does. Add some feta and you get a tangy, savory dish that hits all the right notes. For the Pan-Fried Greek Potatoes recipe, click here. These soft and crispy potatoes make a delicious side dish. For the Parmesan Crusted Potatoes recipe, click here. Purple potatoes add crazy color to your dinner table. Cook this potato just like you would cook any other and enjoy with good doses of rosemary and caramelized onions. For the Purple Potatoes With Rosemary and Caramelized Onions recipe, click here. Peruvian purple potatoes are rich in the antioxidant anthocyanin. Their nutty taste and beautiful appearance sets them apart from other potatoes. This recipe is just one of many great ways to use these medium-starch potatoes. For the Purple Potatoes Wrapped in Puff Pastry recipe, click here. For a quick and easy weeknight meal, this tasty quinoa dish delivers nutritional value while satisfying your hunger. For the Quinoa With Sweet Potatoes and Kale recipe, click here. So simple, yet so satisfying, these potatoes are lightly infused with rosemary aroma while in the oven. For the Roasted Potatoes With Rosemary recipe, click here. Pecorino romano is one of the world’s oldest cheeses. This traditional Italian sheep’s milk cheese, named after the city of Rome, is slightly sharper, saltier, and dryer than Parmesan. Roasted romano red potatoes are incredibly simple to prepare, yet they make an elegant accompaniment to meat, chicken, and fish. 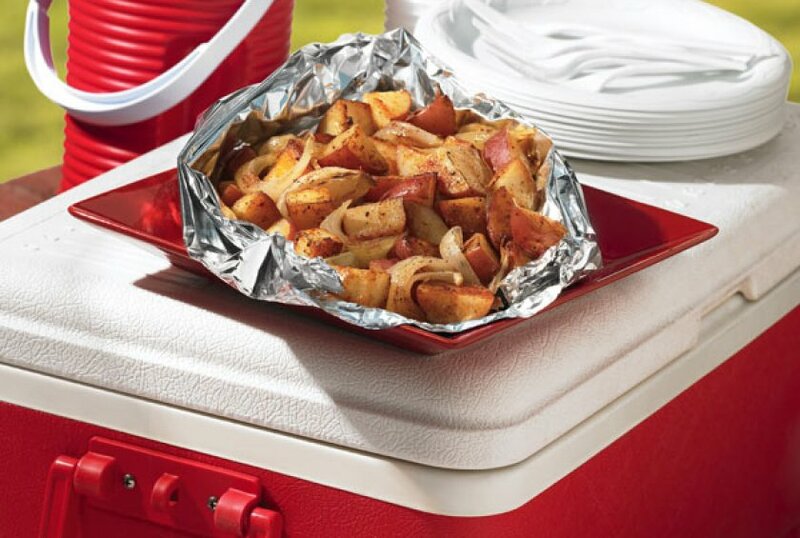 For the Roasted Romano Red Potatoes recipe, click here. Plain ‘ole mundane scalloped potatoes get a makeover and acquire a beautiful hue and flavor thanks the addition of the sun-dried tomato pesto. For the Roasted Scalloped Potatoes With Creamy Sun-Dried Tomato Pesto recipe, click here. Warm spices and sherry vinegar coat a delicious mixture of cubed sweet potatoes and pears. For the Roasted Spiced Sweet Potatoes and Pears recipe, click here. This dish was featured at the 2016 Golden Globe Awards. Serve the roasted sweet potatoes covered in a creamy corn glaze. You’ll impress all of your friends with this creative side dish. For the Salt-Baked Heirloom Sweet Potatoes With Creamed Corn Glaze recipe, click here. For your fix of meat and potatoes, this hearty dish satisfies with a perfect blend of classic flavors from the Emerald Isle. For the Samuel Adams Irish Red Shepherd's Pie With Shamrock Potatoes recipe, click here. Caramelized onions are a perfect match with potatoes, bringing out the best of both ingredients. For the Scalloped Potatoes With Caramelized Onions recipe, click here. Use a slow-cooker to make these soft potatoes. In this recipe, potatoes are first baked, then filled with smoked Cheddar and spicy jalapeños, then baked again. You may need some sour cream to cool down this one! For the Smoked Cheddar and Jalapeño Twice-Baked Potatoes recipe, click here. If you've never had potatoes this way before, you've been missing out. Once fully cooked, potatoes are smashed into discs then fried. For the Smashed and Fried Potatoes recipe, click here. This recipe uses truffle oil and truffled Cheddar cheese. For the Truffled Scalloped Potatoes recipe, click here. White Chocolate?! You read right: White chocolate is loaded with cocoa butter, giving your mashed potatoes a sweet and ultra-creamy texture. Make sure you are making your mashed potatoes the right way — Tyler Florence taught us how and the technique ended up being us just one of the 20 lessons we learned about food this year at The Daily Meal. For the White Chocolate Mashed Potatoes recipe, click here.